User ManualAnnouncement List User Guide List AdministrationHow do I get mail delivery logs for a subscriber? 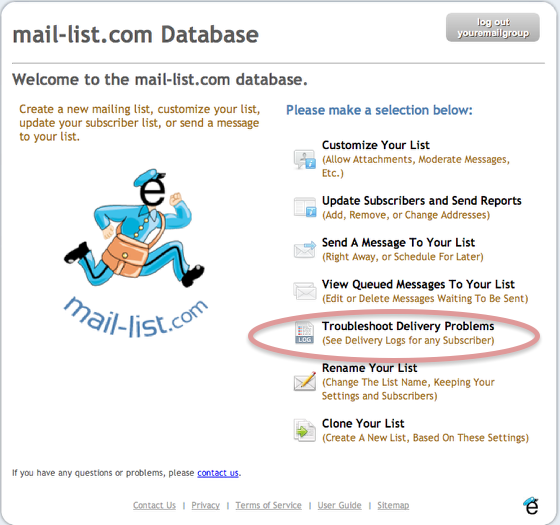 If a subscriber complains about not receiving your messages, look at the "Troubleshoot Subscriber Email Address" section and use the "Subscriber History" option first to make sure they are on your list. So if almost everybody on your list are receiving your messages, then we want to look at the delivery logs of the last step, where we sent it to all of your subscribers. 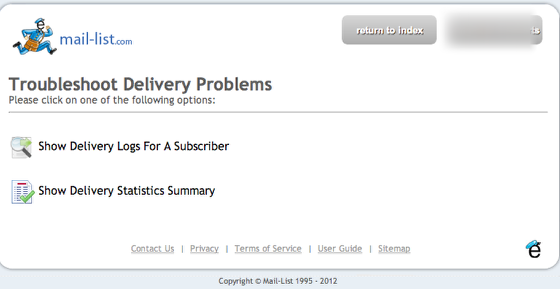 Log into your mail-list account, and select "Troubleshoot Delivery Problems" icon. Press the search button to see the delivery logs. The results are shown, messages that were successfully delivered are highlighted in green. The orange text is the Subject Line of the Message. 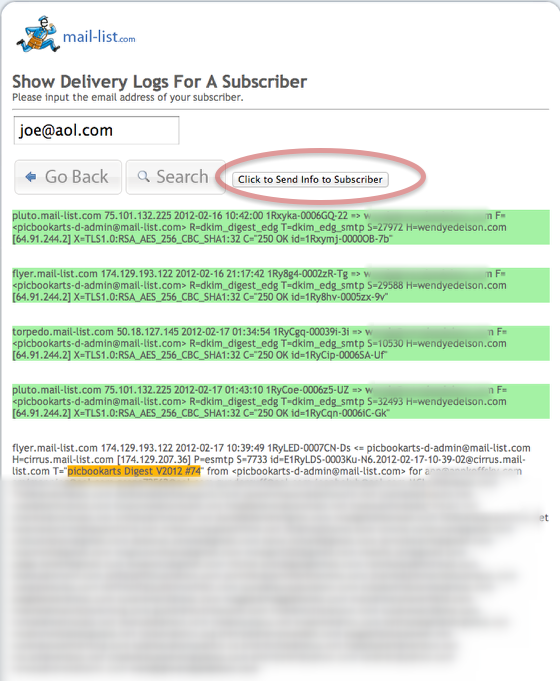 Click on the button to send the delivery logs to your subscriber. They will need to file a trouble ticket with their ISP to figure out where the messages are going, after the ISP accepts the email. We cannot follow the email past this point. Prev: How to send single/multiple commands in one email. Next: How do I adjust my time zone settings? How do I subscribe somebody to the list through the Confirmed Opt-in process? How do I get my subscriber to subscribe to my list/newsletter? How do I get my subscriber to unsubscribe from the list/newsletter? 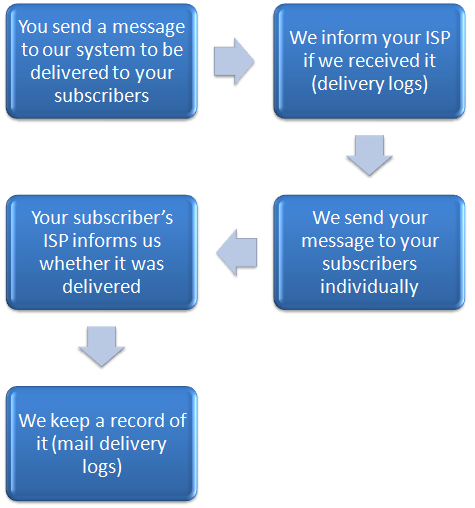 How can I monitor delivery at the major ISPs? How do I preview my message before it goes out to my list of subscribers? How do I approve or reject a message before it goes out to the subscribers? How do I change the message inside a Confirmation Email? How to send single/multiple commands in one email. I just sent a message to my list that contains an error. What should I do? How often should I send my newsletter to my list? How can I know in advance what score SpamAssassin will assign to my email? A copy of my message bounced back into my inbox. What's going on ? I sent my message to the list, but I don't think it worked. Should I send it again? A subscriber just said that they were receiving 80 or more copies of my message. How do I make mail-list.com stop sending so many? Somebody just sent me a nasty and vile email. How to import/export your contacts from other email providers like Hotmail, Yahoo, AOL, Outlook etc. Why does each message sent to AOL addresses shows an additional piece of text at the bottom? What happens when my subscriber's ISP bounces my message? How do I troubleshoot when my message has been bounced by an ISP due to my content or URL being blacklisted?